When I decided to put together a guitar power chords chart, I knew that you were probably looking for more than just a chart. You probably want to get to making music with a solid rock sound as fast as possible. Am I on the right track? I hope so. But, just in case your just looking for a free guitar power chords chart here's one for you. But please keep reading. 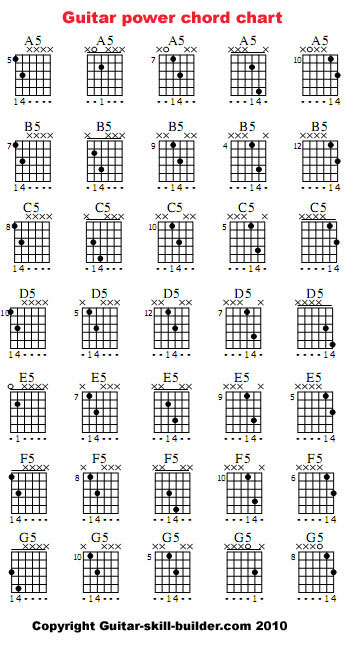 The key to making music with power chords instead of just knowing a bunch of random chords is right below this chart. Downloadable guitar power chords chart with power chord progressions Make it yours - Downloadable PDF Here! Power chords - why do they have that name? Well, the best explanation probably comes from listening to them. Preferably through a large 100 watt tube powered stack turned all the way up. (protect your ears!) You could even get a good explanation with it turned only to 7. A power chord is the most powerful full sounding chord that can come out of a guitar. That's why they are called power chords. They can be rightly claimed to be the basis of most of the Rock and Blues songs out there. Is it easy to play power chords? Yes, Very. If there is a perfect place to start sounding really good on a guitar, it would be power chords. Power chords usually use one, two or at the most three fingers - and that's for the most advanced ones out there.I hope to include some video in the near future to show how really easy this stuff is. If you're not acquainted with reading tab yet - here is my page on how to do just that. Ok, Let's get to the meat. I've used the basic one, four, five chord progression to give you something that is actually music. These are the basis for thousands of songs. Use them wisely and never underestimate the power of them. And speaking of meat you can get a good meaty sound out of these by using the meaty part of your picking hand to partially mute the strings while hitting them with your pick. First up - open power chords. Get this - your gonna have to use one finger on these. I know its tough, but you can handle it. Next guitar power chords - movable power chords. Brace yourself - your gonna have to use two fingers on these. You can do it. What you need the same pattern or progression works anywhere up and down the first and seconds strings. Anywhere you can put a finger on a fret. 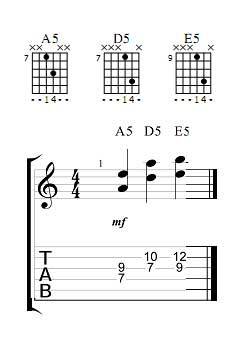 Next guitar power chords chart - power chords on the third and fourth string. Same idea - the name of the chord is the name of the note that your first finger is on. 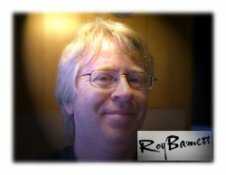 (Learn that fretboard - I've got an easy method to learn it on this site.) These have a higher pitch to them. Experiment and have fun. I'll be adding more - Check back soon. Wait! You came here for chord charts. Check out the secret to making bar chords much easier to play. 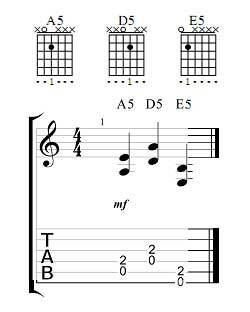 Downloadable, printable Bar chord chart. 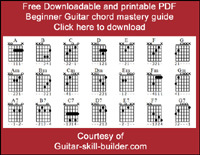 This Downloadable and printable Beginners guitar chords chart will help you start out right. The Blues, an amazing way to easily sound great on guitar. 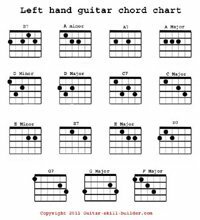 Downloadable and printable Blues guitar chord chart. To all my left handed friends out there in guitar land. Be sure to check out the following pages related to the free guitar power chords chart on this website. 1. 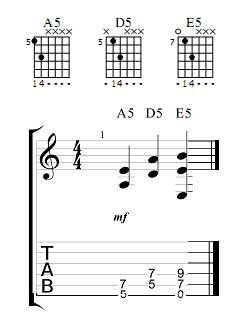 Blues guitar chords - How these simple chords and chord progressions can have you sounding good fast. 2. 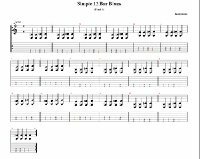 Blues guitar scales - A good blues solo goes great over a power chord progression. Here're the 5 simple patterns you need to make it happen. Return from guitar power chords chart to home page.